If older buildings contribute measurably to the success of cities, why are so few of them “protected” in the traditional sense? 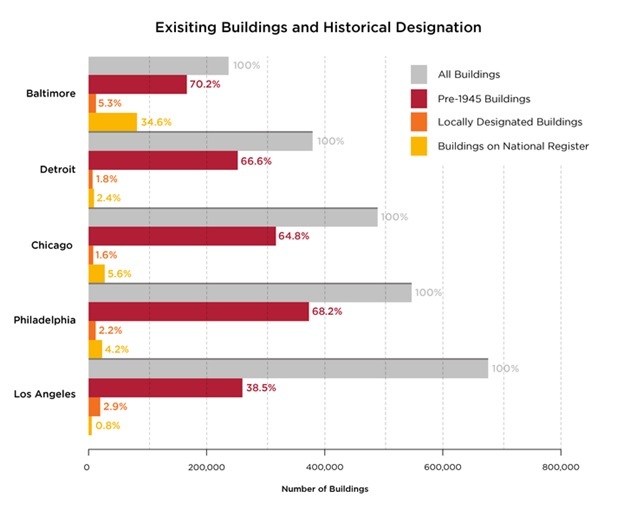 In cities across the country, the Preservation Green Lab has measured the number of pre–World War II buildings against the number of buildings designated as historic on either national or local registries and found that the overlap is surprisingly tiny. In Los Angeles, as in the historic core of many cities, nearly 40 percent of the city’s building stock dates from before 1940—from an era largely without the influence of automobiles—yet only 3 percent of those buildings are on the National Register of Historic Places. That leaves more than 250,000 older and historic buildings that are not protected in any traditional sense of the word. The same has proved to be true in every city in which the Preservation Green Lab has done this research; the average city has 5 percent of the presumably eligible fabric listed on local or national registers. Even places with relatively high percentages—such as Baltimore, where 35 percent is listed on the National Register—leave a large number of older buildings out. This information leads us to two possible conclusions: either we need protect more older buildings with these traditional preservation tools or we need to provide more incentives for protecting older buildings through continued use. The National Trust’s principles of ReUrbanism tell us that the latter is the more sustainable way to steward older buildings as assets essential to the success of cities in the 21st century. Getting beyond the 5 percent requires changing the way development takes place. In 2012 the National Trust and the Urban Land Institute (ULI) launched the Partnership for Building Reuse to better understand the market opportunity for reuse within American cities and uncover ways in which reuse could fuel revitalization efforts. We created a process, working with local ULI district councils, of interviewing stakeholders from a variety of fields—preservation, real estate, finance, community development, and city government—and discussing their shared experiences with reuse projects. What are the barriers faced by small-scale and reuse projects? How does the regulatory environment impact these projects? What tools are can encourage more redevelopment projects? Starting with Los Angeles—then moving to Philadelphia, Baltimore, Chicago, and Detroit—the Partnership for Building Reuse identified specific barriers to reinvestment, then developed action agendas of policies and incentives to make reuse easier and more likely. City-specific reports from each of these efforts can be found here. The experience of discussing barriers and potential solutions in these five cities taught us several critical things about our work promoting reuse as a tool across the country. There is strength in the shared experience. In each city, the success of the Partnership for Building Reuse work was in part due to the emphasis put on getting different practitioners to the table. We heard developers and real estate professionals discuss problems with the building code directly with city staff and local preservation groups share where neighborhood planning efforts may overlap with existing incentive programs. The realization that many different people are thinking about similar things—in this case, redevelopment and reuse—was eye-opening for many participants. Additionally, many of the practitioners were learning that others had run into similar barriers with banks or with preservation or zoning boards—or had invented creative ways to get to the finish line. There is power in discovering shared challenges, but it can be even more powerful to know that someone else has made things work in similar circumstances. In fact, one of the most interesting suggestions—and one that provides an opportunity for future Preservation Green Lab work— was creating a database of solutions to commonly faced issues. By presenting examples of creative solutions, we can show a path forward within the current regulatory framework while also working on passing new policies and incentives. There is a growing opportunity for reuse in (nearly) every type of market. In the five years since we launched this partnership, we have seen the market opportunity for older buildings grow in many places. Not only are offices in adaptive reuse projects commanding more rent per square foot than their Class A counterparts but also more companies are moving into older buildings in historic commercial areas to provide walkable, dense, urban experience desired by many younger workers. 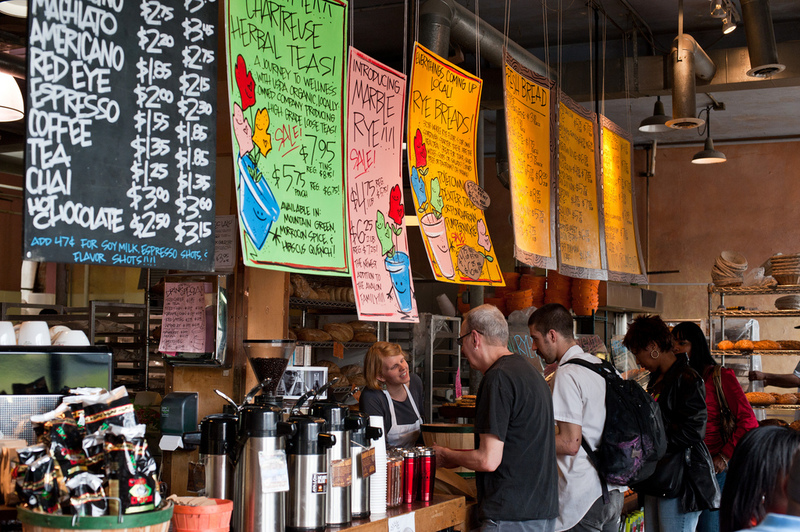 Older buildings provide affordable, adaptable space that harbors most of the small and new businesses in cities across the country. Additionally, reuse projects can usually be initiated and completed faster than large new construction projects, allowing developers to get projects up and running sooner. And these things are true in almost every city—not just those with hot real estate markets. In Detroit, which has a cooler market, the boost that reuse has provided to the local economy in neighborhoods such as Midtown is now spreading to neighborhoods that have traditionally not seen the same level of investment. For-profit and community developers alike are seeing the benefits that reuse projects can provide and working to bring these benefits to more neighborhoods. Creative solutions are being developed on the ground. In all five of the Partnership for Building Reuse cities, the action agendas have spurred changes toward new incentives, policies, and approaches that make reuse an easier option for all developers: for-profit or community developers, those working with large or small projects. All five cities have started, or plan to start, rewriting or updating decades-old zoning documents; many are considering new tools like form-based zoning. Some have formed task forces or working groups to promote specific modifications to building and energy codes. Other cities not in this study are also leading the way with innovative solutions, such as South Carolina’s Abandoned Buildings Revitalization Act and San Francisco’s unbundling of parking costs from residents' housing costs for developments with 10 or more residential units. Planners and code officials in cities across the country are championing changes to local policies. Many of these ideas, along with our top strategies for encouraging reuse, are reflected in a new report summarizing the lessons learned from the Partnership for Building Reuse process. 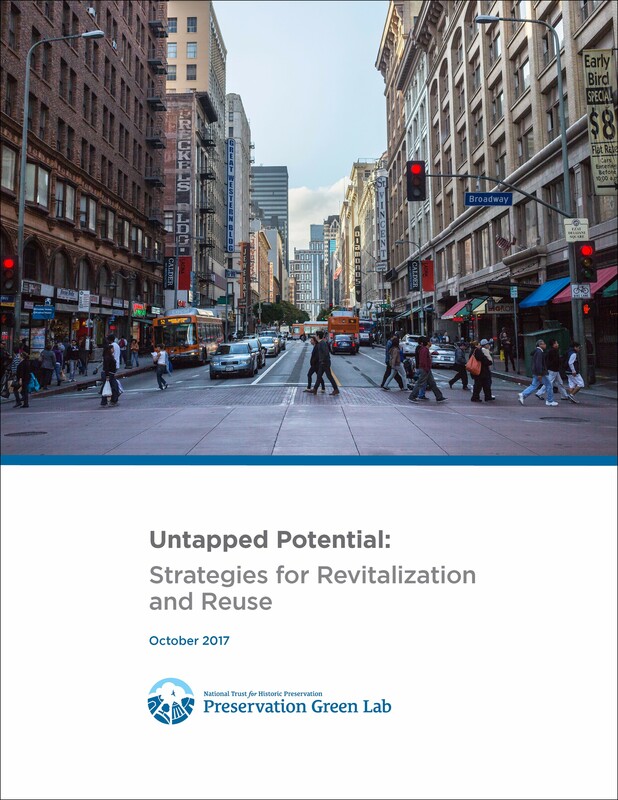 Untapped Potential: Strategies for Revitalization and Reuse includes a summary of the four most common barriers to building reuse and offers best practices for policymakers, developers, and community advocates interested in leveraging reuse to create healthy, equitable, and resilient communities. Margaret O’Neal is the senior manager for the Preservation Green Lab.